Direct file is a practice by which a district attorney -- not a judge -- can decide if a minor as young as 14 will go to adult court. The practice is used differently across California's 58 counties. But whether direct file will continue to be used in the state is up for a vote. It's on the ballot this November under Proposition 57, a broader criminal justice reform initiative backed by Gov. Jerry Brown. If it passes, young people would be required to have a hearing in front of a judge to determine whether their trial would go to adult court or stay in the juvenile system. Youth advocates believe ending direct file would reduce the number of youth cases that end up in adult court, making the whole state more like counties such as San Francisco, a place that rarely uses direct file. "You have 58 counties, 58 different systems, you have 58 different approaches," says Dan Macallair, executive director of the Center on Juvenile and Criminal Justice. His organization recently released a report called “Justice by Geography.” According to the report, kids arrested for a felony are 2.4 times more likely to be direct-filed in counties with a Republican as the chief district attorney. "District attorneys are elected," Macallair says. "A lot of people get elected based upon how tough they are on crime." Other experts, like UC Berkeley criminologist Barry Krisberg, say direct file is increasingly used in rural and Central California. Apart from politics, others say the uneven use of direct file depends on demographics. "By and large it's African-American and Hispanic," says Arthur Bowie, supervisor of the Juvenile Division in the Sacramento County Public Defender's Office. Of the district attorneys, he says, "It’s not so much that they purposefully look at this and say, 'Oh I got this black kid I have to direct-file on.' I think there’s just this indifference." Sacramento County’s rate of direct file is roughly double that of California’s as a whole. The team of Sacramento prosecutors who make decisions about direct file say they don't believe race is what's at play. And just like the district attorney, a judge -- who would be making the decisions about sending a juvenile's case to adult court if Proposition 57 passes -- is also elected. Steve Grippi, Sacramento's chief deputy district attorney, says one reason for Sacramento’s high rate of direct file is resources. "We don’t have as many options as the other counties," he says. That includes counties like San Francisco. The direct-file rate in San Francisco is consistently at the bottom of these charts. This can be in part attributed to a focus on preventative education programs like the one that happened on a recent Tuesday night at the 3rd Street Youth Center & Clinic in San Francisco’s Bayview neighborhood, a historically black community in southeast San Francisco. This workshop has 10 students who sit around white circular tables in a room with brightly colored walls. They range in age from 12 to 21. Facilitator Lisa Thurau divides the students into two teams and prompts them to choose their representative avatars. Minutes later team Marilyn Monroe faces off against team Abraham Lincoln in a game of "Juvenile Justice Jeopardy," the San Francisco version. 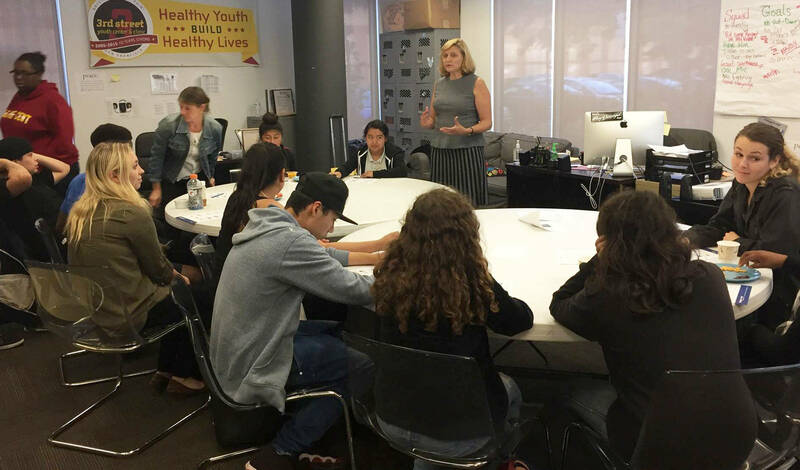 Thurau developed this game through her nonprofit Strategies for Youth, and has traveled from her home of Cambridge, Massachusetts, to bring the game to San Francisco and train future facilitators. Thurau reads a recently selected question out loud: "At what age can you legally buy cigarettes and smoke? Not that you should." 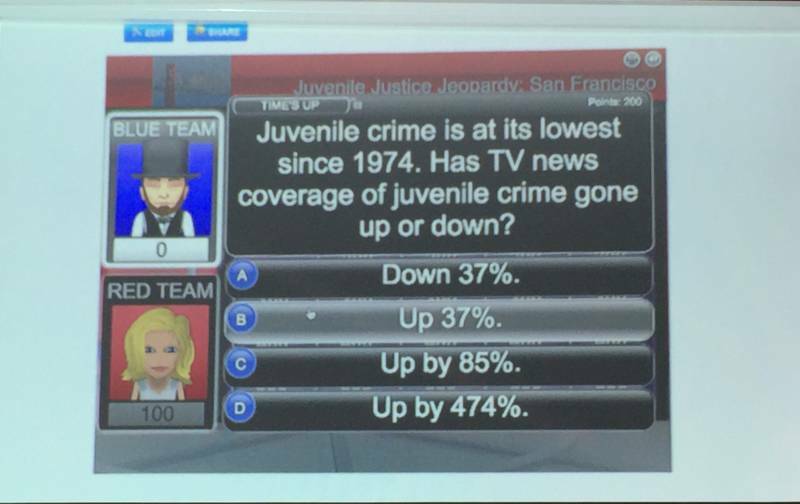 The students call out answers, getting points for the right ones. This workshop is happening in large part due to yet another organization -- this one's called BMAGIC. It was created in 2004 by the San Francisco Public Defender's Office in collaboration with community-based organizations. It represents one of the city's efforts to address justice and crime at a local neighborhood level before young offenders end up in the juvenile justice system. Some counties write off San Francisco as too different. It's a place with tech money, and unlike most counties, which include many cities, San Francisco has just one. That means it has one school district and one police department. But prosecutor Jean Roland says the real magic starts with the mentality of the district attorney's office. They report using direct file three times a year on the high end, and some years they haven’t used it at all. "I think we all share a common thought process of trying to cut off that prison pipeline," Roland says. "If we don’t do it when they’re younger, when they have a chance, it becomes harder and harder to do that as they reach adulthood." Roland points to studies that say a young person’s brain is still developing until their mid-20s. That research is not something all counties value, but in San Francisco the staff repeat it again and again. Patricia Lee, managing attorney of the San Francisco Public Defender’s Juvenile Division, started working at her office over 30 years ago, a time when she says San Francisco didn’t have many good options to rehabilitate youth. She says she gets how people from other counties may feel. 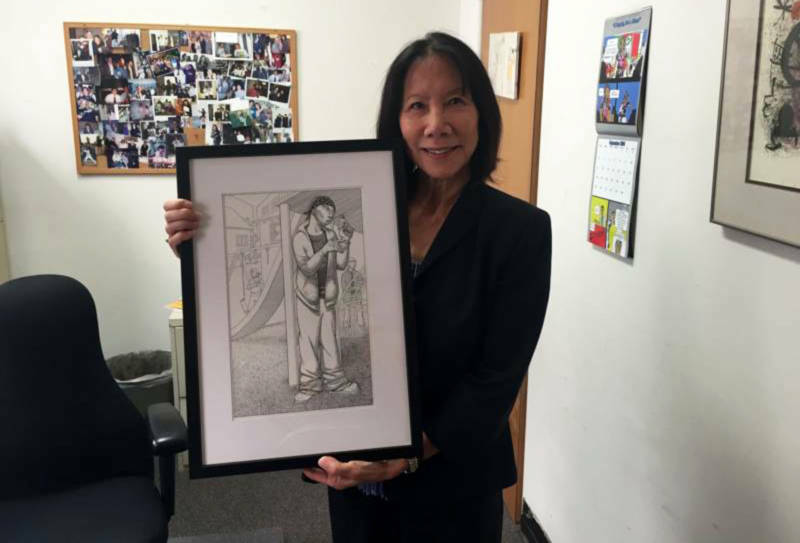 Patricia Lee, managing attorney of the San Francisco Public Defender’s Juvenile Division, holds artwork that she feels demonstrates the challenges many of her clients face. "Twenty-five years ago we were in that position, too," Lee says. But she and her colleagues have gotten creative, she says, and other counties, no matter how different, can do the same. She recommends applying for federal grants, collaborating with other departments across the cities, and even partnering with nearby counties. Lee says these approaches contribute to the declining number of youth involved in San Francisco’s juvenile justice system -- 1,500 kids in 2005 and around 600 today. Youth advocates say that if Proposition 57 passes, it will be symbolic of a shift in attitudes toward kids in the justice system. And, they believe, it will lead to fewer young people in adult court. Back at the 3rd Street Youth Center & Clinic, Thurau raises another question: "How old do you have to be to be sent to adult court?" Nobody gets that one right. Additional support for this reporting comes from the Human Rights Center at the UC Berkeley School of Law and the Investigative Reporting Program.